View all 5 images in gallery. Anyone who would like to donate money may contact St. Andrews Society at (434) 299-5956. A trickling brook follows a downhill corridor of smooth rocks and boulders engraved by time along an imposing mountain called The Priest. Mosquitoes meander above water that pools on pebbles before it finds an opening in the moss-covered rocks to make its way down the Nelson County mountain. The thick August foliage creates shade and traps humidity in the forest. 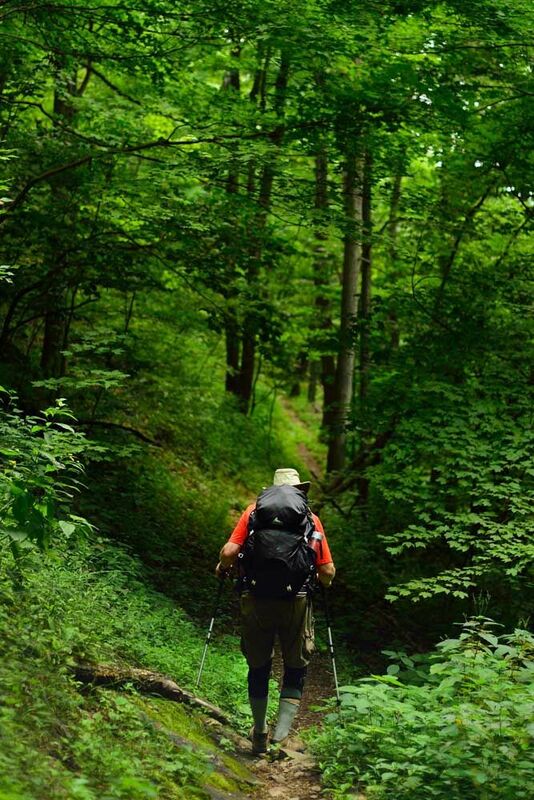 A man known on the Appalachian Trail as i-Robot appears as the trail bends against a shaded backdrop of vivid green flora and stark, brown trunks. 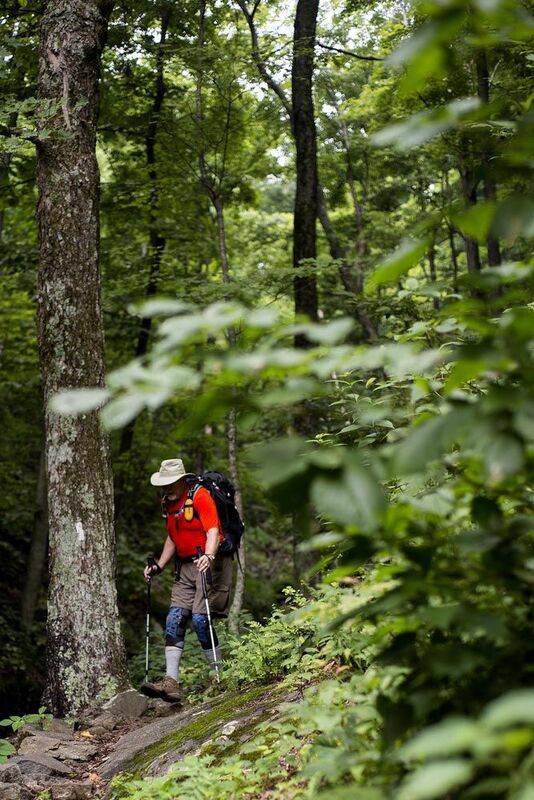 Blue and black braces reinforce his 68-year-old knees, and he eases the burden on his legs with two silver hiking poles. An iPhone is strapped to his chest and a mouthpiece hangs from a water tube that curves from his backpack. He doesn’t know it, but Marv Wooten is in the Priest Wilderness, an area protected under the provisions of the Wilderness Act of 1964, which marks its 50th anniversary this year. Along with Three Ridges — The Priest’s paternal twin across Crabtree Falls Highway — the James River Face and Thunder Ridge wildernesses on the northwest border of Bedford County, the Priest’s 5,963 acres will not be intruded on by modern machinery, nor see significant interference from the hands of humans. The original act did not name any Virginia areas as wilderness and was seen early on as an initiative more fit for the West. But individuals and group efforts at the national, state and local levels preserved the natural landscape largely as it was when Europeans arrived at Plymouth and Jamestown in 23 wilderness areas in the George Washington and Jefferson national forests. “A wilderness, in contrast with those areas where man and his own work dominate the landscape, is herby recognized as an area where the earth and its community of life are untrammeled by man, where man himself is a visitor who does not remain,” according to the act. New roads and structures are prohibited in wilderness areas, as are mining and cutting timber. No motor vehicles — or even mountain bikes — are allowed on their trails. Volun-teer trail-maintenance groups, such as the Natural Bridge Appalachian Trail Club, cannot use chainsaws or motorized weed trimmers. Groups are limited to 10 people to minimize human interference. Exceptions exist for emergencies, such as wildfire rescue missions or cutting a fire line. Proponents say the wilderness areas are nature’s by-right, that native plants and ani-mals deserve a segment of land left alone save for a few trails and limited visitation. They appreciate the solitude in such a recreational experience and the game available in the larger spaces. Opponents say a hands-off approach is not the best way to manage wildlife, which may suffer from disease or be assailed by invasive species. The restrictions on cutting and mining in these areas would prevent potential valuable resources from being extracted in the future. 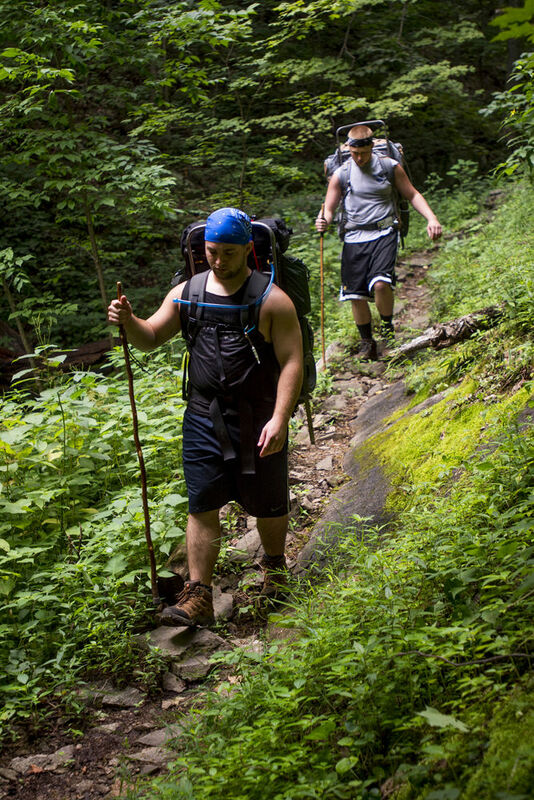 Many wilderness areas are cordoned out of larger sections of national forest, such as the George Washington and Jefferson national forests, which stretch across the state’s northern border. While the average hiker may not be able to tell a wilderness area from the rest of the forest that surrounds it, subtle differences reveal the congressional designation. The grass grows taller and weeds advance farther over hiking trails. The signage shares no mileage. The U.S. Forest Service is guided by an overall management plan, which is supposed to be updated every 15 years. The last plan for the George Washington forest came out in 1993. The last updating process, which included public input, has not yet yielded a plan. Just as a locality may be zoned with certain areas designated as commercial or residen-tial property, federal land is divided and managed by the Forest Service to balance ecology and economy. In many sections of national forest, trees can be cut and resources extracted by outside interests, but the Forest Service is responsible for sustainable management. “The trees are renewable. The agency or company are going to assure there’s going to be regrowth in a generation or two and you’re going to have toilet paper to wipe your behind,” said David Benavitch who worked for the Forest Service as a land manager for al-most 30 years. Trees may also be cut or areas of the forest burned to promote the health of wildlife. But as each wilderness area is named — usually after being suggested in a management plan and then designated by an act of Congress — the landscape is left as it is. West of the Mississippi River, these areas were designated on federal land, one reason western wilderness areas span millions of acres instead of thousands as in the East. 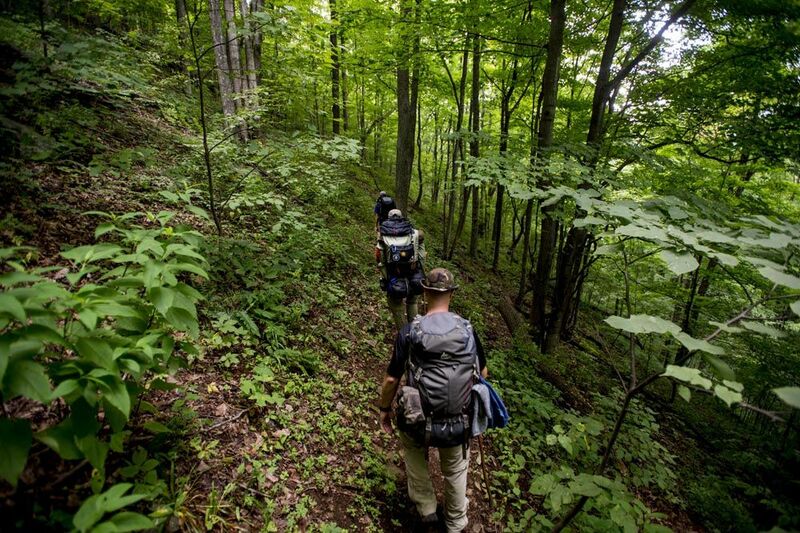 In theEast, the federal government purchased land, much of which had been stripped barren, Benavitch said from his cellphone while taking a break from one of his three weekly hikes on the Appalachian Trail near Buena Vista. “I know some timber companies in the area back in the early 1900s, they owned hundreds of thousands, maybe tens of thousands of acres of these mountains and their only interest was the one-time removal of the timber,” Benavitch said. The result was erosion and frequent fires. Sediment ran into rivers, causing navigation problems in some areas. Through a succession of congressional actions beginning in 1911, the federal government purchased cheap land, first to protect watersheds, and eventually to preserve natural habitat, as well. “Those lands that were picked up for a buck an acre, now they’re priceless,” he said. The Wilderness Act passed in 1964 designated 9.1 million acres in the U.S. as wilderness, and opened the possibility of more protected zones. James River Face, in Bedford and Rockbridge counties, was the first wilderness designated in Virginia through the Eastern Wilderness Act of 1975 and encompasses 8,886 acres. Before that, the 1964 law was seen as more applicable to virgin land in the West. Benavitch said much of the James River Face is cut with logging roads, old strip mines and railroad beds now overtaken by overgrowth. “There will be scars on the land that won’t go away, but it will regenerate itself over time through fires or hurricanes or insects and disease; maybe not on a broad scale but individual groups of trees and so forth. But it will be interesting for future generations to have the 8[,000]- or 10,000-acre tracts of land to compare to the rest of the place,” Benavitch said. James River Face is bordered by Thunder Ridge Wilderness — in Bedford, Botetourt and Rockbridge counties — to the south, which received its wilderness designation of 2,344 acres in 1984. The Three Ridges’ 4,608 acres, along with The Priest, were designated in 2000. Benavitch referred to these areas as “postage stamp wilderness” compared to vast acreage in western U.S., such as the largest one, Wrangell-Saint Elias Wilderness, which encom-passes more than 9 million acres in Alaska. But he said their small size increases their value. “They’re jewels. They’re like little, small places, but they’re special,” he said. In the East, wilderness lands are largely in areas that no longer have a direct economic use or are not commercially viable in the future. “It’s probably rough ground and the mining, all the minerals have been depleted, they’ve been removed so there’s no more interest in there; (they are) steep and rugged and the removal of timber would be uneconomical,” Benavitch said. They’re also chosen to protect endangered species or preserve particularly splendid views or unique geological formations. But politics arise when conservation groups, such as the Virginia Wilderness Committee, choose their battles. The Virginia Wilderness Committee was founded in 1969 and has played a leading role in setting aside Virginia’s 217,625 acres of wilderness. When Ernie Dickerman, “our old guru,” died in 1998, Jim Murray took over as president of the committee. That year the group began work to protect the Priest and Three Ridges from development. The Nelson County sites were picked for their prominence and majesty, but also for realities in gaining political support. “They are particularly spectacular mountains. As you know, they stand out from the main ridge of the Blue Ridge and therefore they make a very significant sort of intrusion on the flatlands. They stand up in the air in all their glory,” said Murray, now a retired University of Virginia biology professor. In terms of practicality, Murray said any lands in the 6th District, which includes Lynchburg, Amherst and a part of Bedford counties, were nonstarters because of opposition by Rep. Bob Goodlatte, who represents the district. The Roanoke Republican said in a written statement this week that he values preserving forest lands for future genera-tions, but the wilderness designation is inflexible to land management. “The restrictions placed on these lands have the greatest impact on local communities, making it more difficult for individuals to access these lands for hiking or biking and to maintain roads for hunting and other recreational purposes,” the statement said. 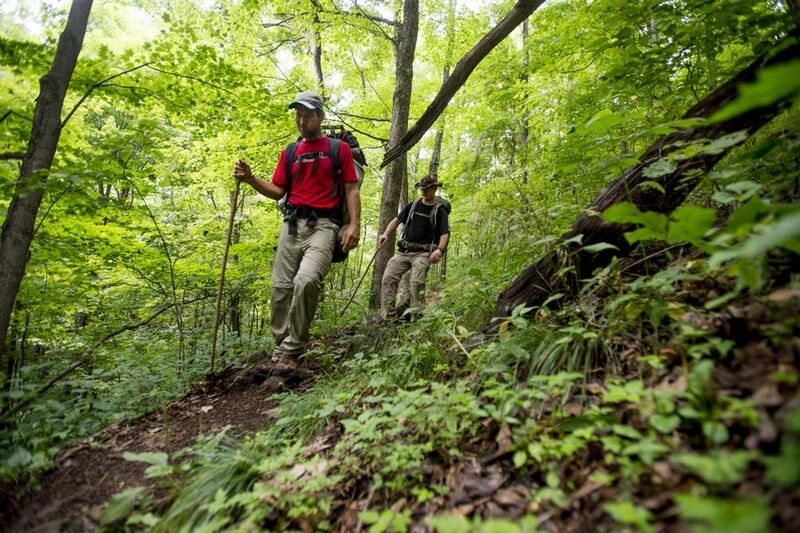 The forest management plan at the time named both The Priest and Three Ridges as potential wilderness, but the Virginia Wilderness Committee still needed local support and a legislator to propose the bill. “At that point, we got our two really important co-conspirators,” Murray said. “One of them was Al Weed, who is a proprietor of Mountain Cove Vineyard down in Nelson County, who gave us a real entrée into the local politics of Nelson County, and the other was David Carr, who is an attorney with the [Southern Environmental Law Center,]” headquartered in Charlottesville. Murray, Weed and Carr then met with then-Independent Virgil Goode, who then represented the 5th District — which includes Nelson, Campbell, Appomattox counties and part of Bed-ford County. He told them he would sponsor the bill if the Nelson County Board of Supervisors supported the notion. “Actually, Virgil was better than his word because we never actually got a formal reso-lution from the board in favor of wilderness, but we did get them to a point where they would say they were neutral,” Murray said. Republican Sen. John Warner sponsored legislation in the U.S. Senate and the bill became law in 2000, preserving the Nelson County area in perpetuity. The last wilderness bill concerning the commonwealth is the Virginia Ridge and Valley Bill as part of the Omnibus Public Land Management Act of 2009. Although secured from chain saws and mining drills, the wilderness areas, along with the forest around them, are threatened by invasive species and disease. The gypsy moth popu-lation has moved south across the area damaging oak trees in particular, according to Ken Landgraf, a natural resource group staff officer with the U.S. Forest Service’s Roanoke office. The hemlock tree population has also been reduced by the hemlock woolly adelgid, a small insect accidentally introduced from Asia, he said by email. And American chestnut trees in the Eastern U.S. were decimated by a blight-causing fungus brought from Japan around 1900. A host of non-native plants, such as garlic mustard, tree-of-heaven and Japanese stiltgrass, have also invaded the region. Even in the wilderness, they are found near trails and the break with the larger forest where human interaction is more common. A non-native plant may be brought in accidentally in the tread in a hiker’s boot or by a migrating animal. “They displace native flora, and they don’t generally have any kind of predators because it’s not their ecosystem. In other words, there aren’t insects that eat them or keep them in control or diseases because they haven’t evolved with Virginia’s ecosystem,” said Laura Neale a member of both the trail club — that maintains a portion of Bedford County Wilderness trail — and the Virginia Wilderness Committee. Regardless of the politics, challenges and philosophical debates presented by the con-cept of wilderness, hikers still perch on the top of The Priest’s 4,000 foot elevation after a four-mile uphill trek. They compare the view of rippling mountains carpeted with thick forest green with that from a false summit on the other side facing flat farmland dotted with buildings. Thunder reverberates from the distance, announcing a storm’s approach. Gray clouds pur-sue them past the top-of-the mountain campsite of i-Robot and a handful of former strangers he met on the Appalachian Trail. Although Wooten’s trail name implies technological fixation, he uses the smart phone primarily for a special AT map. He doesn’t understand those hiking with iPod buds stuck in their ears.